Multi User. Scalable to any size property. Comprehensive and flexible Desktop PMS and fully integrated back up system. This professional multi-user Desktop PMS has provided easy management of a property for desktop PCs and Macintosh since 1993. It is easy-to-use and allows modules to be added that make management of your business right for you. Runs on any PC or Macintosh. Simple installation and setup – records may be imported from a previous system using simple spreadsheets. 100% Microsoft Windows and Macintosh OS X compatible. Pricing and Allocation Control – flexible rate tools allow you to make rooms available for minimum stays, maximum stays, closed to arrivals, etc. Manage by Rate, Season, or Agent – at prices and terms you decide. Packaging – sell dynamic or fixed Packages at your website or through thousands of GDS and travel sites. Guest Relationship Marketing – easily perform direct marketing campaigns to your guests (email, fax, or print) using custom letters you create or design in your favorite word processing program. The easiest marketing tool we have seen! Room and Cleaning management – Daily, weekly, or monthly. Full Clean and Stay Over daily reports. Security and Data Protection – encryption built in, with unlimited user-definable access levels for each Personnel. Guest Profiling – record information on each Guest, such as their past activity, address, phone, company, source and type. Track their behavior, bookings, and purchases over time. Personalization – the system adapts to your organization. Commission tracking and management of all Agent activity; the ones you enter manually and ones you accept from the Internet. 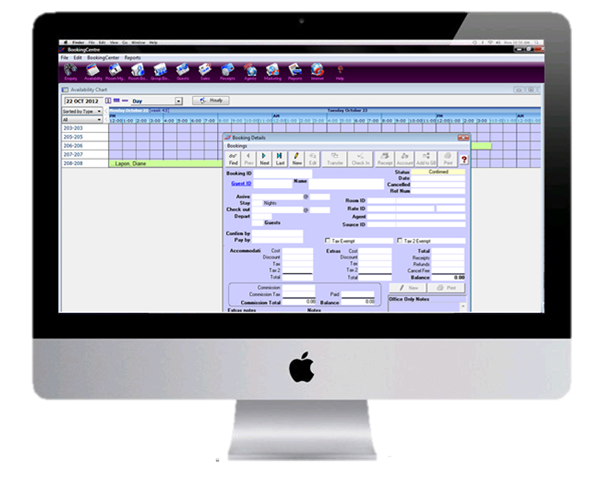 Accounting interface – QuickBooks, AccountEdge, and Sage/Peachtree – accounting interface with user-definable batch processing makes BookingCenter work seamlessly with your favorite G/L system. Pop Up Lists – for fast and accurate lookup of codes. If you use Apple computers, iPads, and iPhones, BookingCenter offers you a number of easy-to-use and powerful options for distribution and management for your resort, B&B, inn, or hotel. Cloud PMS with anytime-anywhere access for daily operations integrated with a Desktop PMS Backup to avoid disruptions during outages.